The earthquake of January 2010 altered the approach of Haiti and its foreign donors to fighting disease, the Washington Post reports on Monday, explaining that the disaster changed minds "about what was possible — and necessary" when it came to public health. 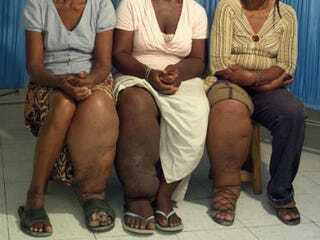 Case in point: the treatment of lymphatic filariasis, a condition also known as "elephantitis" that is spread by mosquitoes and can lead to severe and debilitation swelling of an arm or leg. Lymphatic filariasis is a "neglected tropical disease," the name for a group of maladies that have disappeared from industrialized countries or never existed there. Others include onchocerciasis ("river blindness"), schistosomiasis ("snail fever"), soil-based intestinal worms, and the eye infection trachoma. For 1.9 billion people, most of them poor, they are still threats. Eliminating the diseases has been an object of intense effort and research over the past decade. The work is largely unknown outside the global health community, overshadowed by higher-profile campaigns against AIDS, malaria and tuberculosis. "There was this feeling that we just couldn't quit. Things had come too far to walk away," said Patrick J. Lammie, a scientist at the U.S. Centers for Disease Control and Prevention who has worked on filariasis in Haiti for more than two decades. As a consequence, for four weeks this past winter, two medicines — albendazole and diethylcarbamazine (DEC) — were handed out in Port-au-Prince's schools, markets, churches, factories and public places. They were also delivered to the squatter camps where more than a half-million earthquake-displaced people still lived. In all, about 70 percent of the capital's population took them, according to a CDC survey in the spring.